They weren’t bucolic little honeybees like the ones I tell the guys to leave alone because they’re friends who help grow our fruits and vegetables. It was a literal wasp’s nest. 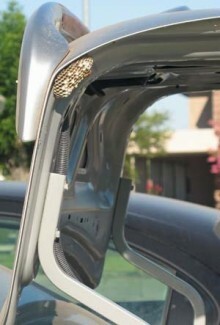 I’m guessing some queen declared the car a permanent structure and decided it was a great place to start a colony. A quick check with the local zoning department would have let her know we don’t have a permit for an outbuilding. I just had no way to put the “mobile” in automobile. In almost seven months, the car had made exactly one trip around the block as person after person welched on promises to help with it - I don’t drive a stick. A neighbor eventually showed me how to start the car so at least the battery wouldn’t die, but I was not about to try to drive it. And then I welched on a promise to the guys that we’d wash the car and make Dad’s third baby all sparkly for his return. I’m glad I did. I was anaphalyctic to bees as a child, though I haven’t been stung by anything bigger than a sweat bee in more than 30 years and don’t know if I still am. The guys both have been stung with no reaction, though Boots’ foot did puff considerably and these things can escalate with each sting. It added up to a trip delayed for Dad, who practically was skipping out the door yesterday morning in anticipation of quality time with the third baby. He was back seconds later. We – technically, he, because all I did was fetch a broom – went about removal the wrong way. Other than lighting a fire – clearly not an option with a nest that near a gas tank – memory failed me as to how my dad used to go about this. I took the coward’s way out, running into the house as my husband knocked the nest off the trunk and into the yard. A few hours later, the wasps were swarming the car again. I’m not sure what an angry wasp looks like – really, I’m not about to get close enough to peer into their eyes – but these did appear exorcised at their eviction. The only insect spray in the house was for ants. I went to one store – no dice. I lucked out at my second stop, if you consider paying $9 for a one-use can of bug spray lucking out. If you gotta, you gotta, though. By the time I got home, more squatter wasps were buzzing around trying to reclaim their space. A few quick blasts quelled the invasion. Bee spray now is added to the permanent list of items needed to welcome Dad home. Whoa! I am really glad you and The Guys steered clear! Once, some years back, my husband’s commute car became infested with ants. He took a “bomb” to it. That killed off the investation and he learned to be much more careful about food in his vehicle. Hope it’s all better now and the bees move along. Come to think of it, my dad used to take a stick with a gasoline soaked rag on the end, ingite it, and let the flames at the tip of the rag burn up the wasp nest. He always sent us indoors for this so we wouldn’t get stung. On the other hand, the nests were under the eaves of the roof of the house. Hm. And we were sent into the house. Hmmm. Good luck with ridding the third baby of the infestation! HA! My first car was a Volare (everyone sing along now!) that had chronic mushroom problems. It wasn’t just me either – one of our neighbors had a Volare with the same problem, so we eventually decided there was some sort of design flaw that let water ooze into the floorboards and create the right climate.